Summer is here in Houston, Texas. Our thermostat has not registered under 100 in almost two weeks and no rain in site. After the flood of April I thought I would never wish for the gentle cooling effects of rain again. Bring it on, besides I have flood insurance now, not that I wishing for one, it would be nice for a good soaking rain the garden is in need. We are back in the house and mostly settled in from having to redo it due to the inches of water that had collected there over April 28th. I am most grateful to my adopted kids Dawn and Donnie Bell who came with a crew from Dallas and fixed the house and added some new improvements as well. Once they left then Gary fell and broke his hip in four places…it seems once it rained it started to pour! He is on the mend, walking with a walker and in a much better mood since he is not in so much pain. I feel like I finally have some space to be creative and have started writing to get caught up on all fronts. 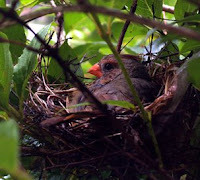 We have a pair of cardinals that have taken up residence in the patio tree in front of our living room window. We have watched them build the nest and now she is sitting on the nest. Right there in front of us nature has provided us the best show. Here are some excerpts from the newsletter I have just sent out…enjoy! World peace is not an abstract concept removed from our everyday lives. It starts with trust between one individual and another-each of us opening our hearts and speaking with sincerity, communicating and touching the other on the deepest level. We begin to understand that the only acknowledgement that truly matters is the acknowledgement you give yourself. We can only reach a mental and emotional place in which we truly feel like authentic individuals when we choose to do what we do because it fulfills us rather than to attract the attention of those in a position to offer validation. While recognition can be both sweet and satisfying, we address the needs of our souls only when our motives come from within the very depths of our being. For this reason, we must feel a strong connection to the choices we make if we want to fulfill our purpose. Some paths will prove more rewarding than others, but there is no substitute for the pride we feel upon knowing that we are following a destiny that is uniquely our own. We will no longer feel ignored when we remind ourselves that our desires are not related to outer-world glory but are a product of our wish for fulfillment. "Those who are always looking on the world with cynicism and prejudice are like a sheet of paper already written upon and on which there is no room for new words. "Don't bother about what you already know, or what you don't know. Don't think about the past or the future, just let the divine hands write down each day the surprises of the present". When we accept that caring for ourselves is no more selfish or self-centered than caring for the important people in our lives, we come to realize that our willingness to see to our own needs facilitates our ability to ensure the well-being of others. If we are tired or worn out because we have spent all our available time or expended the whole of our energy stores helping others thrive and achieve contentment, we have nothing left with which to refuel. When we save a portion of ourselves, however, so that we may use that to satisfy our own wants and needs, we ensure that we always have plenty of resources to devote to those whom we wish to see fulfilled. As you nurture your loved ones today, you will be a better caregiver if you remember to care for yourself. We tend to derive far more satisfaction from the pursuits we engage in when we dedicate our minds and our souls to the task at hand. However inconsequential these duties may seem, they are likely in some way related to our larger purpose in life. When we recognize and acknowledge this, we begin to see that a lack of commitment in just one area of our existence can interfere with our ability to make the most of our aptitudes on multiple levels. We need only regard each and every one of our objectives as being worthy of our attention to ensure that we never overlook the importance of any one of them. The more dedicated we are to our purpose, the smoother our larger life paths will be. You will feel competent and purposeful when you honor your goals by embodying your devotion to them in your choices. It is my pleasure to invite you to attend any of the courses offered this Fall. The Reiki Two class scheduled for the 19-20 of September in San Antonio includes Saturday afternoon in the surrounding countryside The Reiki One and Reiki Two courses in Houston in September on 26th and 27th and on November 21st and 22nd will be taught at my home.